Use your mobile phone to view this trackers strike data! Android App to view StormVue data files! App information at Google Play. If you have a Symbian^3 mobile device you can install Vasama! Project is hosted at http://gitorious.org/vasama. YouTube video of app here. Installation package here (requires qt 4.7; the sisx is not a smart installer). If your mobile device is able to run Java MIDP 2.0/CLDC 1.1 applications you can install SPARK.CLX™! 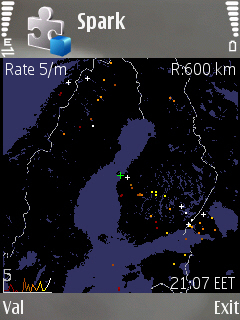 It's a similar interface as the StormVue-applet. You can get more detailed information from the developers website here.